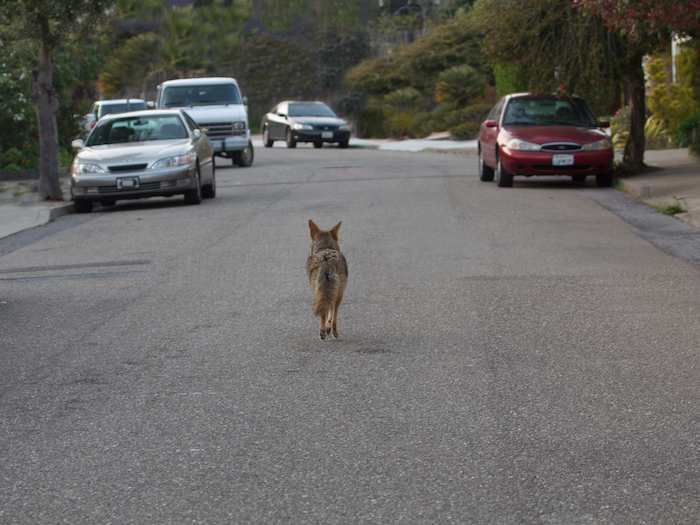 A coyote may follow you and your dog — the dog is the issue — out of curiosity or to monitor it, the same way you yourself might follow a “suspect” prowling through your neighborhood, to find out where they were going and what they were doing. 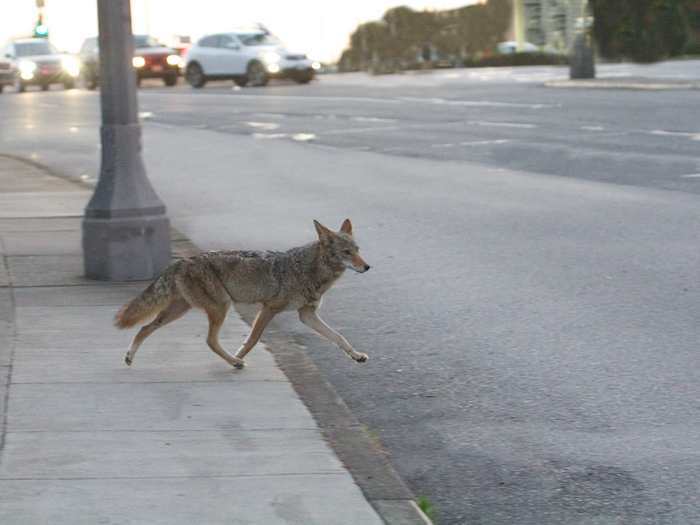 If you find that you are being followed by a coyote, walk away from the coyote — and don’t run, running invites chasing. 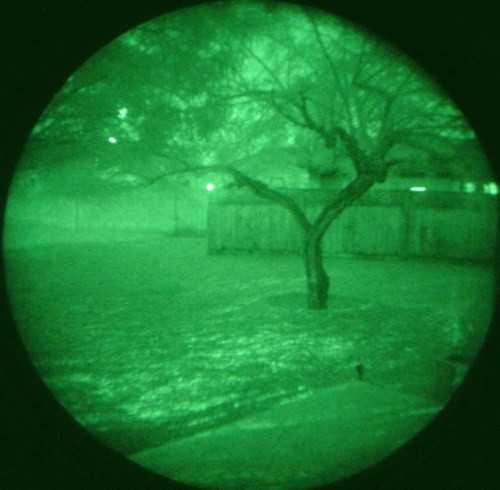 Keep aware of the coyote and shoo it off effectively if it gets too close, and move on. And keep your dog leashed. Pick up a small dog. 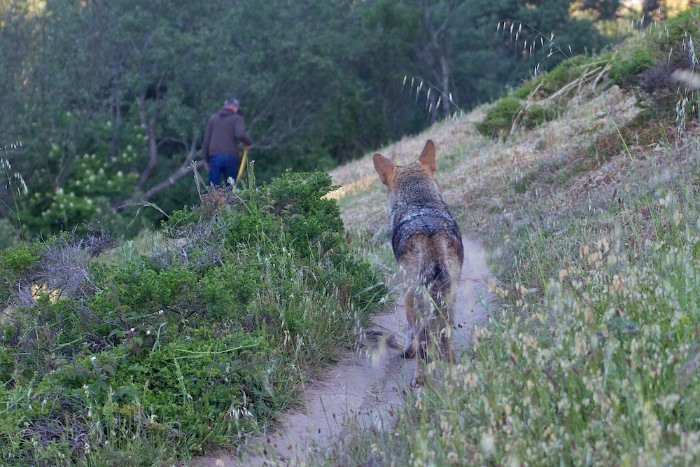 The leashing is to keep your dog from being distracted by the coyote and going after it. You want to avoid engagement between the two. I’ve seen this same following-behavior used for a purpose totally different from either curiosity or monitoring. 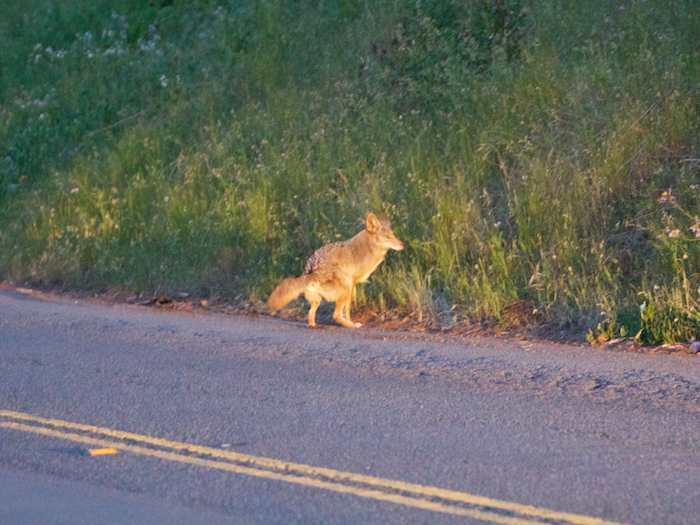 It was used effectively by a coyote to avoid detection, as a human and his dog passed by. 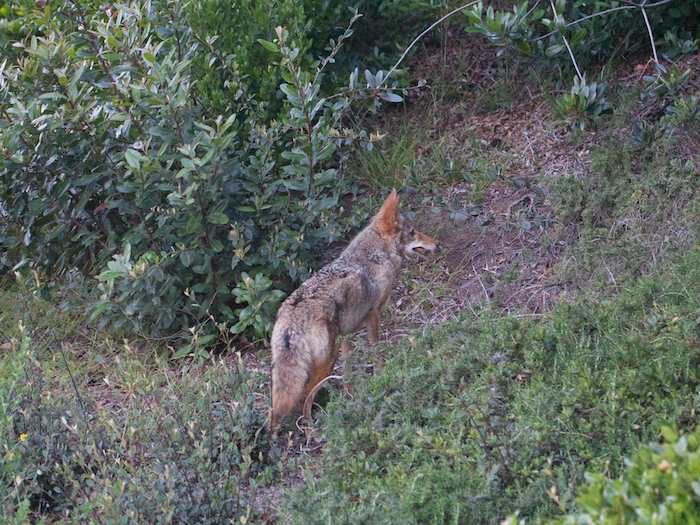 The dog had a history of chasing the coyote, and the man had a history of pursuing the coyote aggressively with his camera. So this coyote had a particular interest in avoiding this duo. The dog and person passed while the coyote stood absolutely still and remained hidden and undetected in a dark wooded area. Then, to my great surprise, the coyote came out of hiding and followed them at a close 30 feet. The coyote did so carefully, on high alert and prepared to bolt if necessary. This went on for about 200 feet before the coyote veered off to where the brush picked up again and it could continue undetected through the bushes. Neither the man nor his dog ever looked back! In this case, what seems to be going on is that, by following in the duo’s “wake”, the coyote was continuing to avoid detection. Animals and people tend to look around themselves, but much less frequently directly in back of themselves. We all tend to concentrate on sounds, smells and sights which are in front of us or to the sides. 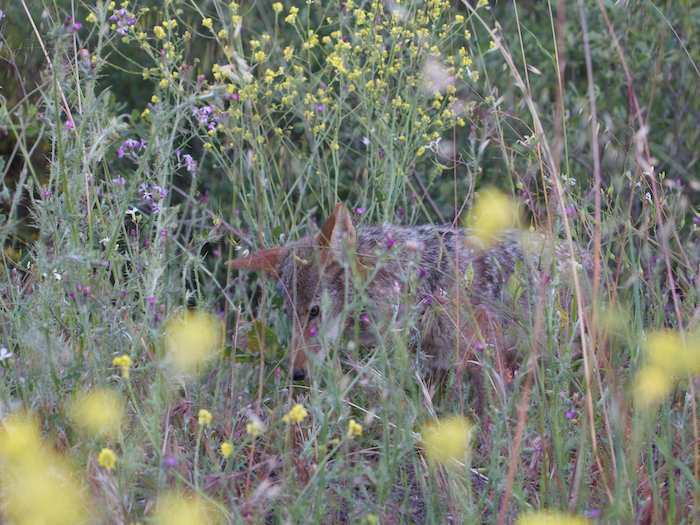 Coyotes know this, and “follow” as a method to avoid being seen. Jumping a four-foot fence? No problem! The coyote watched as some people and their dogs got closer and closer. It was time to split, and the safest getaway was over that fence. No one in the group saw the coyote who continued on its way. 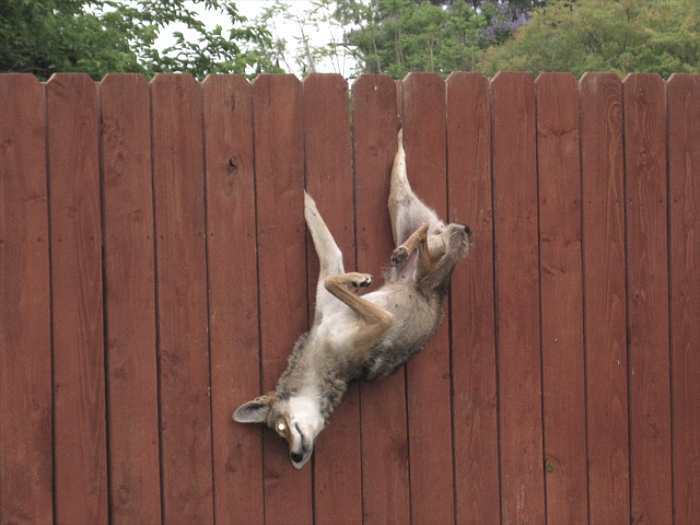 However, I found this photo of a coyote that got caught on the fence. When I first saw the photo, I thought the coyote had been placed there by one of those coyote haters who string coyotes on fences. 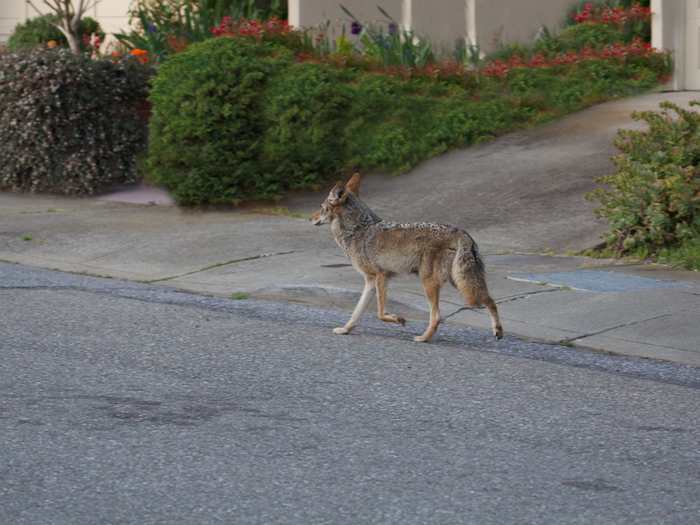 But no — the coyote was alive and got there on her own! Her legs caught between the slats of the fence as she went over the top and then she slid down, pinning herself tightly in there. There was no way out of this situation without help. The fence was over 6 feet high — apparently too high for this coyote to make it over safely. Maybe a more experienced coyote would have had better luck. We don’t know how long she hung there, waiting for her end. Here is more wildlife, aside from the coyotes. 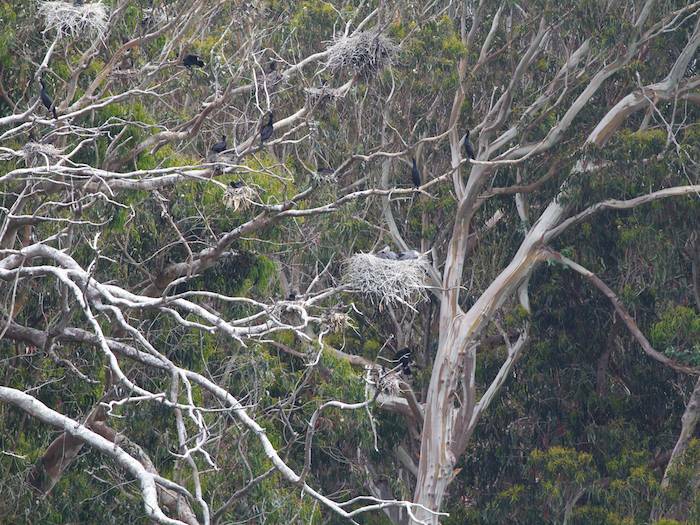 I went to see the Great Blue Heron nest in the Eucalyptus tree on Lake Merced. The “nativists” will have you believe that the Eucalyptus are useless for wildlife and that “they are fire hazards which must be removed.” These folks seem to have their “eyes wide shut”. We have found hawks, owls, cormorants, Great Blue Herons, monarch butterflies, bees, hummingbirds, bats and countless songbirds live in these trees. And as for fire, the Eucalyptus were planted as a windbreak which serves to *prevent* fires! We’ve had no forest fires in San Francisco, but we have had grass and brush fires — and the surrounding Eucalyptus did not burn! Nativists want to replace trees with grasses. 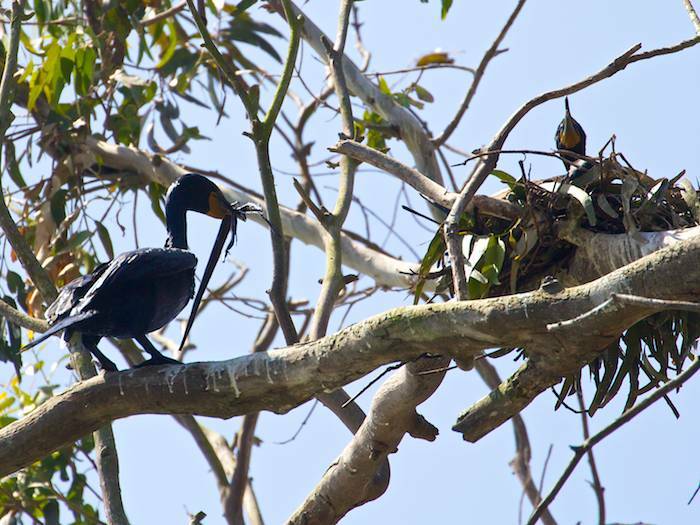 There were about 12 cormorant nests in the Eucalyptus tree — yes, all in ONE tree — with chicks in various stages of development, including a mom sitting on her unhatched eggs, so I watched them as well as the Great Blue Heron nest. 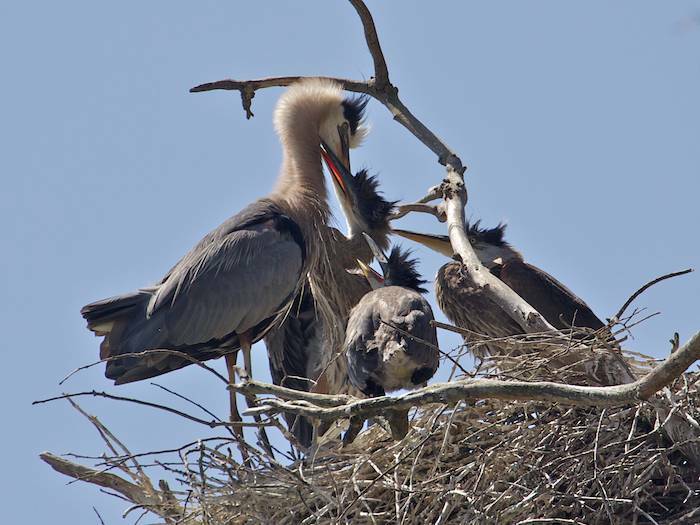 The Great Blue Heron nest had three large nestlings. They sat low, stood up, groomed, stretched their wings, stretched their necks, looked at me, pooped, yawned, made a strange sound which I can’t even begin to describe, picked bugs off one another and grabbed each other’s beaks. They were pretty calm and subdued. No adults were in sight. Where was Mom? 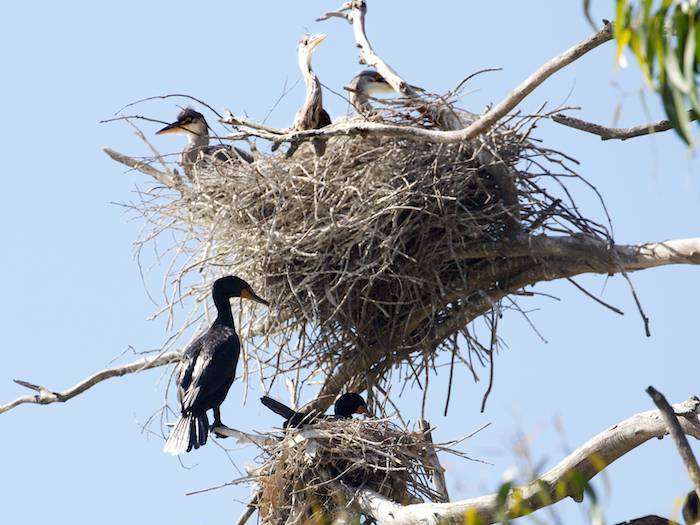 The cormorant parents, on the other hand, were omnipresent and extremely busy. 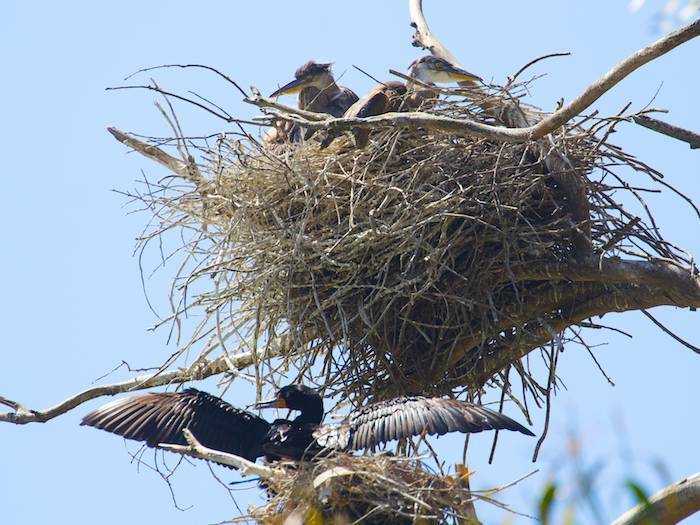 When new nesting material and food were brought home by one cormorant parent, the other took off to gather the same stuff, and while the one parent was out collecting supplies, the other parent stayed home. It went like clockwork. A few sunbathed and a few spread their wings to dry — they don’t have the oils on their feathers that other waterbirds have, so they must allow their wings to dry out and they do so by holding them out parallel to their bodies. There was an entire cormorant village active up there in that tree. After a full hour of my watching the chicks, Mom Blue Heron finally made an appearance. The chicks had not seen her approach, but their energy picked up and the excitement began when they saw her finally arrive — her return marked the beginning of a feeding frenzy. She stood on the edge of the nest and extended her head and her long neck up. She just stood there like this, seemingly inactive. I wondered why she didn’t get busy and feed the kids. 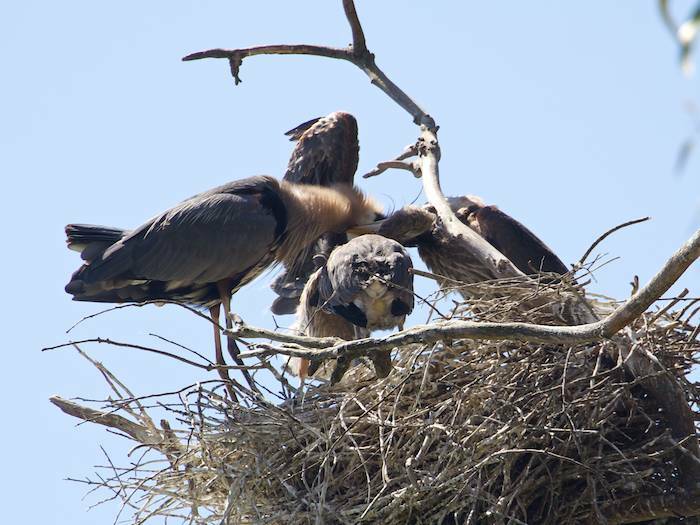 Then the biggest of the three chicks also stretched up high, next to Mom — he was impatient. The other two remained crouched low with beaks up, in the “feed me” position. But the one now standing next to Mom grabbed her beak as best he could with his own long and seemingly clunky beak — the beak worked like clumsy chop sticks. The chick seemed to be trying to pull Mom’s bill down. And soon, he seemed to succeed — Mom, too, bent over. I don’t know if the stretching fellow actually pulled her down, or simply directed Mom’s bill into his, and I couldn’t tell if he was successful in getting the fish. I know there was a large fish because I saw the tail fin. 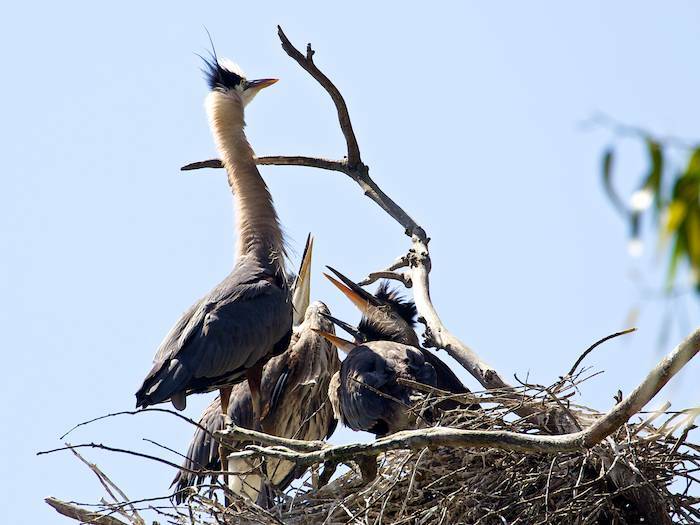 It’s when all four herons were all huddled down — forming a football huddle — that most of the feeding occurred. I could not see the feeding. This scene was repeated over and over, so I’m assuming Mom had carried at least 3 large fish in her belly for them. In fact, when she was doing nothing but stretching her neck up in the air, when she first arrived, she may have been attempting to regurgitate the fish to feed the youngsters. When her supply was gone, she turned around and flew off. The chicks began to groom again, but soon they settled down to wait . . . and yawn, and stretch their wings, and look at me . . . . 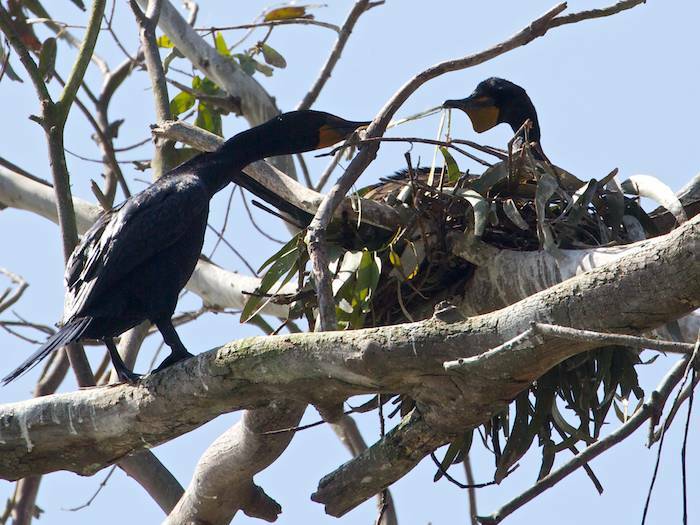 The cormorants continued their activity, with food being brought every few minutes to both youngsters and to mothers sitting atop eggs. Also, nesting material was constantly brought in. The cormorants were consistently on the move, except those drying themselves in the sun. It appeared to me — in my imagination — that the herons became disgruntled and discouraged — or, maybe it was me. After waiting almost another hour, they had huddled together on the opposite side from the spot where Mom had landed and departed. I imagined them plotting their flight from the coop to find a more attentive Mom. The thought occurred to me only because the cormorants were omnipresent and giving full attention to the youngsters. Then, though, I thought of the time my siblings and I plotted our own getaway . . .
We had been ousted from the house — I have no idea why — probably we were being too noisy — but it was drizzling and cold outside . . . So, did this constitute child abuse — at least mistreatment? We hung on the yard gym and talked and discussed it. My older brother suddenly announced he was going to run away from home. It sounded brave, daring and exciting. “But where would you go?” I asked him. He sounded so definite, like he really might know what he was talking about. He said he would go to Barney’s — that was our grandfather. I wondered how on earth he knew how to get there — he was 8, I was 6 and my sister was 5. I didn’t want to be left out of such a plan, even though I knew I didn’t have the capacity to carry it out. So I said, “Yes, I’m going too.” “NO”, he answered in a very definite tone. I couldn’t come with him. He was going alone. OK. I still didn’t want to be left out. I tried thinking of a place I could go. Oh, yes. I’ll go to Uncle Clyde’s . . . Younger sister Debby, too, tried to think of where she could go. She knew that if I couldn’t go with Robby, neither could she, and neither could she come with me. The rule had been set by my brother, as the eldest. Ah, yes. Debby decided on Wright Kirk’s place — this was her godfather. I think these were all the *relatives* in the world that we possessed. My brother took punishment much harder than the rest of us. He was the eldest and often the leader, but may have felt he had done nothing to deserve this. He was really hurt/incensed by this *mistreatment*, whereas I accepted what came. We were often punished together as the “gang of three” instead of as individuals. My mother had a short fuse and I had come to accept that. So for me, I was following Robby’s lead, not out of a feeling of having been abused, but for the thrill of it and to keep up. I had heard about running away before — isn’t that what the little Lost Boys did in Peter Pan? Of course the plan was utterly impossible, but the magic of the moment stuck with me because I’ve always remembered our planning as a positive event. My mother got over her mad and we were allowed back into the house. None of us had any intention of running away. We were whiling away the time — and also angry ourselves — secretly spinning a sort of imaginary retribution which would never be fulfilled. It was much too scary and anxiety-provoking for little kids. Nonetheless it brought us kids closer together to cope with parents, and for me it had turned a *punishment* into a fond and memorable event. I digress. . . 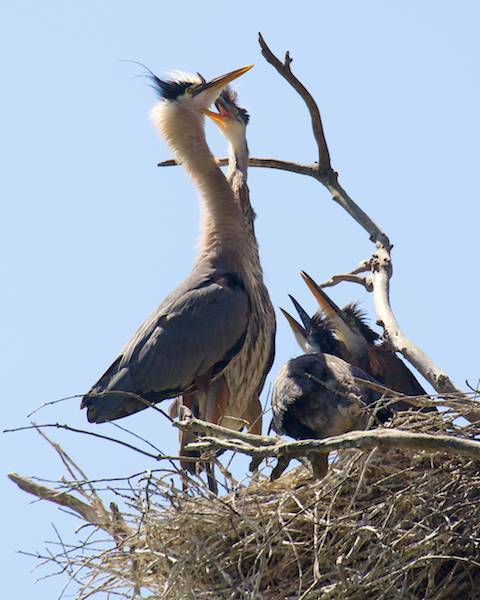 I looked up at the herons: *I* was the one waiting for Mom Heron to return to the nest — it had been an hour since the last feeding. Suddenly all three chicks hurried to the side of the nest from which Mom had departed. They looked excited, attentive, with their beaks agape. This time they saw her coming. I had my camera ready. “Mom, Mom, MOM . . . ” I could hear them yelling in my imagination. Actually, they were totally quiet. And then, there she was, and the frenzy-feeding repeated itself. Coyotes are usually solitary hunters. 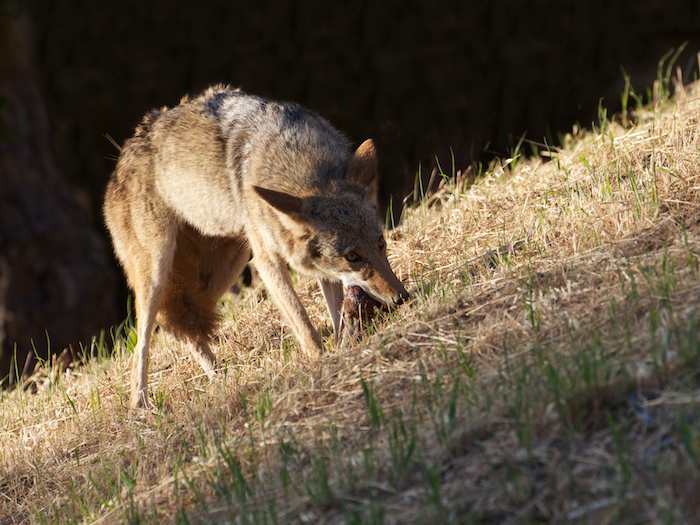 This is due to their main food source being small rodents — mice, voles, gophers — which can’t really be divided up between several coyotes. 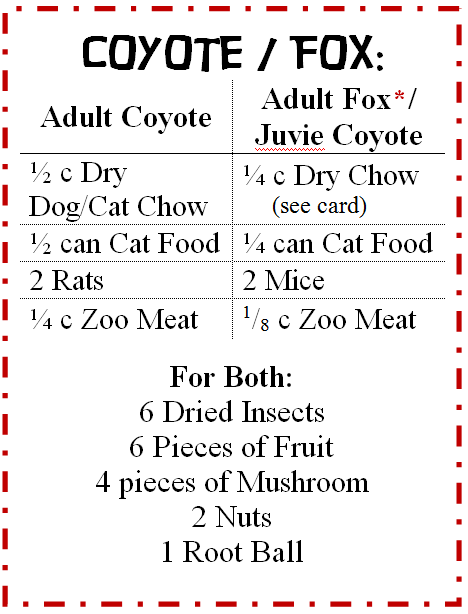 However, coyotes will engage in teamwork when hunting a larger animal, such as anything bigger than a raccoon. 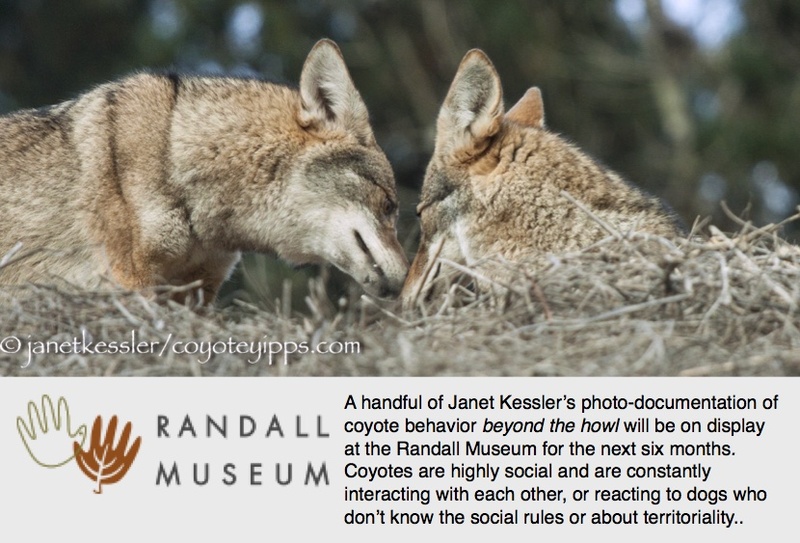 The above sequence of photos shows two coyotes who are together as they hunt. They both head for the same spot when they hear a rodent underground. The female is the alpha — she digs more energetically than the male. Maybe she was hungrier than he was. The male must have sensed this because he stopped digging but kept his gaze on the spot where she was digging. So she glared at him: “Hey man, give me space!” He moved off to the side to wait patiently, feigning no interest in the meal she had just claimed as hers. She continued digging ferociously and reaped the reward of her labors: it was a huge gopher. He watched, seemingly disinterested. When she finished her meal, he got up to walk on with her. Sometimes I like posting about something different than coyotes. I found a tiny little Bushtit — 3.5 inches from tip of the beak to tip of the tail — searching for, finding, and testing building materials for it’s nest. The materials did not pass muster, and were abandoned. Birds have very high standards for their young.